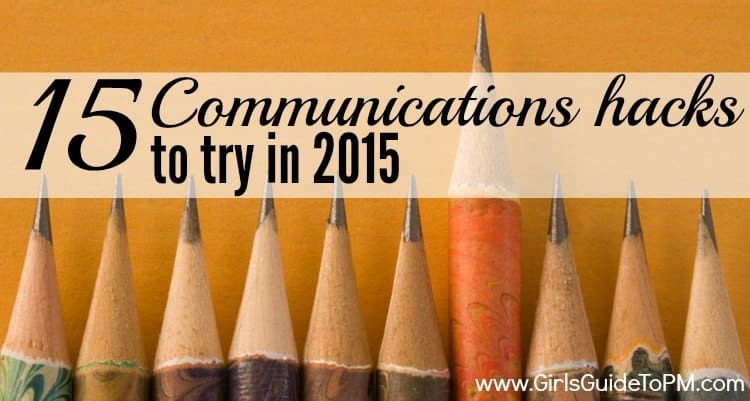 Want to get ahead with your project communications this year? Here are 15 hacks to try in the coming months. The milestone tracker I use is a simple Excel spreadsheet. It lists the milestones in one column, organised by project phase. It also includes the name of the person responsible, the target date and any notes. That’s four columns. I colour-code the date column too, with red, amber and green to show whether the delivery is on track, at risk or needing serious management attention. When the date has been reached and the milestone achieved, I change it to say Complete. A very simple, very effective way of communicating the high-level project dates to stakeholders. How many times do you send the same messages to people? The covering emails for the ‘here is the monthly report’ and the ‘please find attached my expenses’ type emails can all be templated. Either set up templates in your email system or keep a file of template messages. Then copy and paste to save you typing them out. Create checklists for tasks that you do frequently like hosting Project Board meetings or project kick off. Checklists are in use in hospitals and airlines because they help people remember everything they need to do and ensure nothing gets forgotten. Pick a few tasks that you struggle with (for me it’s creating POs and then paying the invoices) and create a checklist so you don’t have to think about it anymore. Have you tried this? It really works. Stand up during your phone calls and you’ll get through the conversation faster. Get all your face-to-face meetings in the diary now for the year. Stakeholders are busy people so block out their time for your project today. Use the register to note the type of asset, when it was created, where it is stored and how it could be reused. Then you’ll always be able to find that elusive picture when you need it. Even if it’s just the tag on a gift – handwriting personal thank yous is a powerful message of appreciation. I use the TimeAndDate.com meeting planner. If you work with international teams then this is invaluable. Try to switch it about so one team isn’t always the group coming in really early or staying really late. Set up distribution lists for your project. Create one for project team members, Project Board members and any other contacts. This saves me a lot of time trying to remember to include everyone. Plot out your project communications for the year. When are you doing a newsletter? When are you having a briefing conference call? What are the deadlines for your staff magazine? If I don’t do this I end up not having enough time to do the communications to a suitable standard (and therefore risk being late or working late). A calendar means I can add the dates to my project plan or diary and never miss a deadline. Diary your repeating events like reporting deadlines. Block time out in your calendar to do these tasks or you’ll find yourself sucked into the daily To Do list and squeezing your reporting into half an hour on Friday afternoon. What reporting can you automate? I don’t use any systems that enable automated project reporting but if you do have project management software that automatically creates dashboards or can produce bespoke reports at a single click then make sure you know how to use it. Time your project communications around what other people are doing. Tag on to another department’s newsletter and use other teams to get your message out where it makes sense to do so. I don’t do this enough – it’s something I need to work on this year. I used to update my voicemail message daily in one of my previous jobs but today I only change it when I’m on leave for more than a day. It is a good idea to update your voicemail message. It is so easy to do and it gives a very professional impression. Change it as often as sensible, for example to let callers know that you are out all day at a workshop or that you are on vacation. Just remember to change it back! Install some apps to help you be more productive while you are out and about. Make sure your team can get in contact with you so use tools that they use as well. There are plenty of collaboration tools to try. Download a few and see if they work for you and your team. If they don’t make you more productive, uninstall them and try something else. Unfortunately, it’s all about trial and error. What works for one project manager won’t work for another. What else are you going to resolve to do in 2015? Let us know your tips in the comments. Fantastic blog. Very much enjoyed the structure and project management points you made.